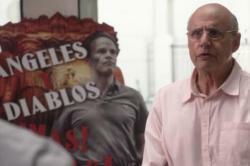 Arrested Development “Double Crossers” recap: George Bluth and Dr. Normal. George Sr. can’t buy love. Byron Boneparth: Is that a gal I see? No, it’s just a fallacy! Aisha Harris: Where is that from? Harris: Oh. While I wasn’t too crazy about “Double Crossers” the first time I watched it, I enjoyed it much more when viewing it for a second time. And I think that this episode is an improvement over George Sr.’s first themed episode. What about you? Boneparth: I agree. Unfortunately, though, I think that the George Sr. storyline is one of the weaker parts of the new season, and it doesn’t help that a) it’s in the very beginning of the season when relatively few of the other characters are making full-fledged appearances and b) most of the full story is still patchy and mysterious. And I can’t help but to assume that it would have been at least a bit more enjoyable had five or 10 minutes been snipped away here or there. And yes, George Sr.’s storyline (as well as Lindsay’s) is for me, the weakest. While I like that this time around we actually see the strings being pulled by Lucille as she tells George and, unknowingly, Oscar, what to do and how to go about doing it while she’s on house arrest, I just didn’t find the mistaken identity gag nearly as funny as I did during Seasons 1-3. Boneparth: Somehow Oscar is a lot funnier with shoulder-length hair. Harris: A few other continuous running gags/Easter Eggs I noticed: When Lucille is on the phone with George, trying to entice him to come visit her for another romp, one of the things written on the mirror is “Clambake in room 52b.” That was a joke at one point in the original run, right? Or am I making that up? Boneparth: I’m not sure it rings a bell, actually. That’s one of the things about the new season, though. It’s so hard to keep track of all the running jokes, sometimes you think that everything’s a running joke. Harris: Makes sense—I found it funny, nonetheless. Boneparth: I sort of almost assumed that “Cinco de Quatro” was a joke from the show’s original run at one point. Harris: I’m still not sure what to make of Cinco de Quatro. I don’t recall ever hearing about it before. The only thing I can think of is that it’s a continuation of the Bluths’ complete inability and/or willingness to understand Spanish—like that whole “hermano” subplot with Gob’s girlfriend Marta in Season 1. Here, they all think they’re saying the fourth of May, when really they’re saying the fifth of fourth. Boneparth: Yes, I think that’s probably the big joke. Also, notice that George Sr. needs Dr. Norman to write him a prescription for Mexican nudie magazines. Presumably he doesn’t know how to ask for them himself. Harris: One running joke I certainly remember regarding the horrifying references to Lucille’s nether regions: In one episode of the original run, Lucille mentions a “musty old claptrap,” which is supposed to also imply Lucille’s own … musty old claptrap. Here, we get an equally funny line when Oscar has to correct himself to mean that he was quite literally talking about the “sweaty old hot box” at the compound in the desert. Not Lucille’s … sweaty old hot box. Boneparth: It was also somewhat of a relief to have a Gob-heavy episode in what had so far been a relatively Gob-free season. What would this series be after all without everybody’s favorite gentleman honey farmer? And if you were listening closely, during George Sr.’s phone call with Herbert Love, they were playing a real Herman Cain campaign song in the background, which was a nice touch. Harris: Right—let’s talk a bit about Terry Crews’ character, Herbert Love. I’m a fan of Crews, and it’s nice to see him here, especially as a charismatic Republican spouting a “High-Low” plan that sounds not unlike Cain’s 9-9-9 plan. Boneparth: Yes, as does his “flip flap flop” plan when George Sr. wants him to change his position on the wall. Boneparth: I thought his character was great and he was a really seamless addition to the main cast. And that’s another thing that I think the new season is doing really well—creating plenty of opportunities for old characters reappearing but still leaving room for new characters like Love and Dr. Norman. Harris: I think it’s more hit-or-miss. Boneparth: The good news I think—and I speak as somebody who quasi-binged and watched the whole thing already—is that from the next episode out, the rest of the season is really a lot funnier. Harris: I agree. The first six suffer from too much exposition, though I can understand why they felt they had to go in that direction. Boneparth: Yes, it was almost as if I was drinking a glass of water with a homeopathic memory of Arrested Development. Harris: Another thing—I continue to admire the very small touches that AD still employs in its sets. When Michael and Gob are hanging out in the model home, Gob attempts to open the (product placement-ready) Mike’s Hard Lemonade on the counter, and breaks off the entire counter corner. And in the next scene, you notice that this has happened on the living room counter as well! Harris: Well, is there anything else to be said? I do hope that you don’t assume that I’m a Republican strategist just because I’m black, Byron. Harris: Ah, yes. Byron Boneparth. I think that is a crazy town name. Boneparth: And I probably look like somebody who would eat at CW Swapigans also. Read more in Slate about Arrested Development.